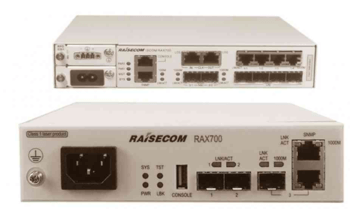 The ISCOM2600G-HI series switches are the new-generation, environmental-friendly, and energy-saving Ethernet switches independently developed by Raisecom, which can provide GE access and 10GE uplink interfaces. Based on the high-performance hardware platform and Raisecom new-generation switching software platform, the ISCOM2600G-HI series switches provide multiple features, such as flexible networking, various security control, and easy management and meanwhile support mature IPv6 and complete OAM. The ISCOM2600G-HI series switches support Intelligent Stacking Framework (ISF), which means that multiple switches can be virtualized as one device logically to form a highly reliable, scalable, manageable, and intelligent network. This series can be widely applied to multiplescenarios, such as MAN access, enterprise/campus access, and GE to desktop. Besides, for the MAN and industrial users, the ISCOM2600-HI series switches can be connected downstream to the low-end switches or transceivers and aggregated upstream into the large-capacity L3 switches through GE fibers, 10GE fibers, or link aggregation. In addition to traditional STP/RSTP/MSTP spanning tree protocol, the ISCOM2600G-HI series switches also support the latest Ethernet Ring Protection Switching (ERPS) standard defined in ITU-T G.8032, which applies to various ring network topologies, such as single ring, tangent ring, and intersecting ring, and can provide sub-50ms protection switching to achieve carrier-grade reliability. The ISCOM2600G-HI series switches support interface backup dual-homed protection, manual and static LACP to implement uplink backup, greatly improving the reliability of access-side devices, and also support G.8031 to implement end-to-end linear protection. The ISCOM2600G-HI series switches support loop detection, automatic loop detection and loop elimination, to ensure the stable operation of the network. The ISCOM2600G-HI series switches supportcomplete Ethernet OAM (IEEE 802.3ah/802.1ag) to fast detectlink faults. The ISCOM2600G-HI series switches support multiple access control technologies and user authentication security technologies, such as ACL, Dot1X, RADIUS, and TACACS+ to flexibly adapt to multiple authentication requirements of the network environment. ARP attacks and ARP virus are the number one threat to LAN security. The ISCOM2600G-HI series switches support rich ARP defense functions, such as dynamic ARP detection which can check user validity and ARP packet validity, and ARP rate limiting which prevents the CPU from being impacted by a large number of ARP packets, and so on. ISCOM2600G-HI series switches discard invalid packets that do not match the binding entry by establishing and maintaining the DHCP snooping binding table. By using the DHCP Snooping trusted interface, the ISCOM2600G-HI series switch can also guarantee the legality of the DHCP server. 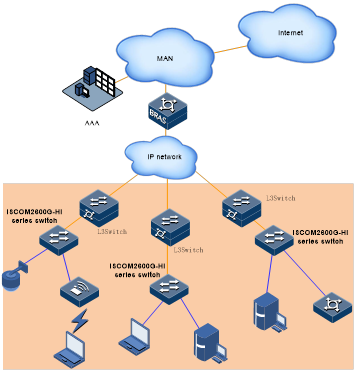 The ISCOM2600G-HI series switches support various management modes, such as SNMPv1/v2c/v3, Raisecom NMS, CLI, Web network management, Telnet, in-band management, and out-of-band management, which facilitate maintenance; support multiple encryption methods, such as SSH2.0, which make management more secure; and support RMON and interface traffic statistics which facilitate network optimization and reconstruction. The ISCOM2600G-HI series switches support automatic configuration downloading and software upgrade from the DHCP server, and batch remote upgrade through Raisecom NMS to reduce the operation and maintenance costs. The ISCOM2600G-HI series switches support MAC-based VLAN partitions, which is a good solution to the smart and flexible management of mobile office. The power interface of the ISCOM2600G-HI series switches is on the front panel, which simplifies the operation and maintenance (single-sided) of the entire equipment, and provides more flexible cabinet placement. You can place the cabinet against the wall or against the cabinet, saving the space. With complete IPV6 management and certification functions, the ISCOM2600-HI series switches are suitable for the management in IPV6 network management environment. The ISCOM2600G-HI series switches support ISF, which means thatup to 9 switches can be logically virtualized into one switch to simplify configurations and management. Device reliability can be improved through redundancy backup among member devices.Link reliability can be improved through link aggregation across devices.Interfaces and bandwidths can be easily expanded by adding member devices. The GE interfaces or 10GE interfaces can be stacked, which is of low cost and simple structure. The ISCOM2600G-HI series switches also support long-distance stacking. MAC address table l Support 16K MAC addresses. l Support automatic learning and aging of MAC addresses and support static MAC address. l Support static, dynamic, and blackhole MAC entries. l Support MAC address limits based on interface and VLAN. l Support managing MAC address flapping. l Support MAC/protocol/IP subnet/interface-based VLAN. l Support basic QinQ and selective QinQ. Ring network protection l Support ERPS (G.8032). Reliability l Support manual aggregation, static LACP, and MC-LAG. l Support Ethernet OAM 802.3ah,802.1ag, and Y.1731. IP routing Support IPV4 and IPV6 static routes, RIP, and OSPF*. IPV6 features l Support IPv6 Ping, IPv6 Tracert, IPv6 Telnet, and IPV6 FTP/TFTP/SFTP. l Support IPv6 SNMP and Raisecom NviewIPV6 network management. l Support IPV6 Radius, IPV6 TACACS+ IPV6 NTP, and SNTP. l Support IPv6 Source Guard. Multicast l Support IGMPv1/v2/v3 Snooping and immediate leave. l Support interface/user-based immediate leave. l Support static multicast group. l Support MLD Snooping v1/v2. DHCP l Support DHCP Client and DHCPv6 Client. l Support DHCP Server andOption43. l Support DHCP Snooping Option61/82 and DHCP Relay option82. Mirroring l Support traffic mirroring. l Support local and remote port mirroring. QoS/ACL l Support rate limiting in the ingress direction and egress direction of the interface. l Each interface supports 8 queues. l Support SP, WRR, DRR, SP+WRR, and SP+DRR. l Support 802.1p and DSCP priority remarking for packets. l Support interface-based traffic monitoring and dual-rate three-color CAR. l Support L2–L4packet filtering based on source MAC address and destination MAC address. l Support packet filtering based on source IP address, destination IP address, TCP/UDP source/destination interface ID, protocol, and VLAN. l Support ACL in the egress direction. Security l Support hierarchical user management and password protection. l Support 801.x authentication based on interface and MAC address. l Support CPU protection and anti-ARP attack. l Support a combination binding of IP address, MAC address, and interface. l Support blackhole MAC address. l Support MAC address limits. l Support AAA,RADIUS, and TACACS+. l Support port security MAC. l Support DHCP Snooping and DHCP server which prevents against spoofing. l Support BPDU guard androot guard. Management and maintenance l Support ISF*. l Support Console interface and out-of-band management interface. l Support various management modes, such as SNMPv1/v2c/v3, CLI, Web management, Telnet, and SSHv2.0. l Support Raisecom NView NMS. l Support Syslog and hierarchical alarm reporting. l Support Ping and Tracert. l Support Dying Gasp alarm. l Support NTP and SNTP. l Support virtual cable test. l Support auto-provisioning, which means that it can download configurations and upgrade software automatically from the DHCP server. l Support interface loop detection. l Support optical module DDM. l Support DLDP unidirectional link detection. ISCOM2624GF-4C-HI providesa RPS interface which is 12V. Energy saving and environmental protection l Support 802.3azEEE energy conservation. l The ISCOM2624GF-4C-HI can adjust fan rate according to the temperature. Other models adopt a fanless and silent design. Environment requirements l Operating temperature: 0?–50? The feature marked with * refers to the features that are not released now but being planned. In enterprise/campus access scenario, the ISCOM2600G-HI series switches serve as the access devices and are connected downstream to the data devices in the enterprise/campus/residency and upstream to the L3 aggregation devices, accessing and transmitting the bandwidth, voice, Wi-Fi, and video services, thus meeting the users’ requirements for high bandwidth and multi-service access.